When my friends informed me that their new condo had an outdoor grill over looking the mountains, I planned the entire weekend around cooking outside. Every meal utilized the grill – including when I brought out the pots and pans and heated them directly on the grill. Nothing beats outdoor cooking – especially in the mountains with a great breeze. Grilling Brie was an experiment that turned out extremely well. The trick is to keep the cheese very cold until your ready to cook and heat the grill to high. The process won’t take too long – you’re grilling just enough to make beautiful grill marks and heat the cheese through. This will take about four minutes on each side – but please use your own discretion. And, by no means should you press down on the cheese with a spatula. Meanwhile, warm honey with a handful or two of quarter fresh mission figs. Once the cheese is starting to ooze slightly and you can see the grill marks, transfer to a platter. 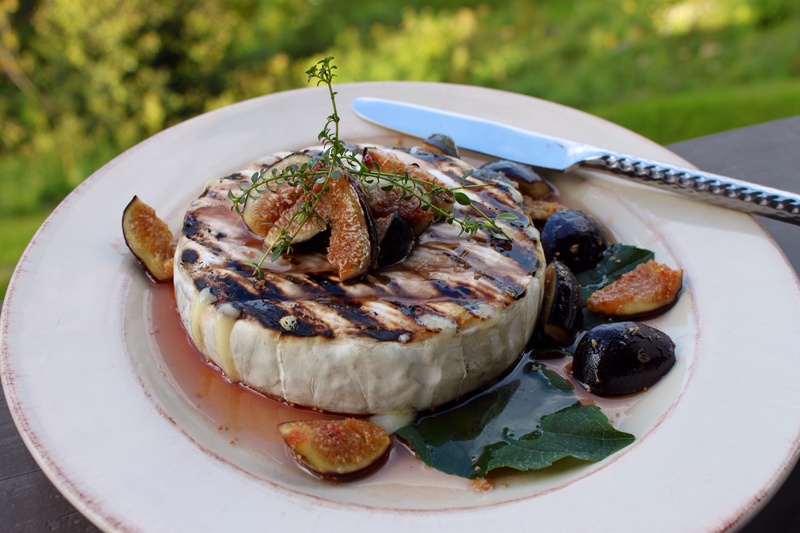 Drizzle with honey, figs and a pinch of good sea salt. Serve with crackers or grilled baguette. Crazy good.